What kind of walls can Cinside sensors see through? All types of building materials have different properties, and they all effect the signal in different ways. In general, a dense and thick wall damps the signal more, and the range decreases. A homogeneous metal plate, eg a white board or metal roof is impossible to penetrate with the energies we are using. Metal reinforcements in concrete walls degrade performance, but as long there are gaps in between bars it is possible. What is the detecting area/range? the damping in the path between the sensor and the object. The damping depends on the material properties and its thickness. The width of the scanned sector depends on the antenna in the sensor. Cinside sensors typically have a width of 35 to 90 degrees. Attention should be made that the systems are not totally blind outside these typical given angles but have the main sensitivity within that sector. With the 2 GHz systems (e.g. HumanFinder and StickRadar) we can achieve more penetration to the cost of small movement sensitivity. How small motions can be detected? How small vibrations may be detected? In our motion-sensing devices (e.g. 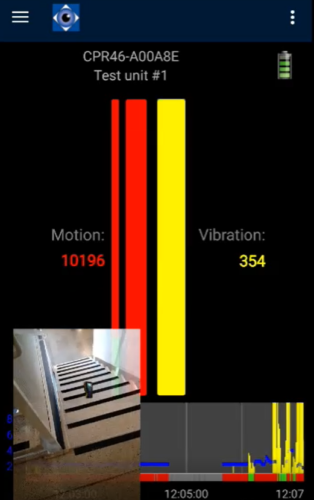 CPR4, CIP, HumanFinder and CiWater), accelerometers sense the device’s self-movement to reduce false alerts when the sensor is moved and to alert the operator that the sensor is moved, shown in yellow in indicators and graphs. These self-movement sensors are sensitive to very small movements such as when the device is moved, a knock on the wall the sensor is attached to, or a door closing. It is discovered that the vibration sensors can be useful as a complement to the radar during surveillance to detect environmental vibrations. In CiMonA there is an option to show a vibration bar together with a radar motion bar. Below is an example of the vibration view from drop tests. In the drop-test video the “vibrations” where quite substantial. In applications where more subtle vibrations want to be detected, such as a knock from a survivor or steps from an intruder, we have an option, a 100 times more sensitive sensor than our standard self-motion-detector. This built-in hyper-sensitive vibration sensor is close to the sensitivity of a bulkier geophone. With this compact multi-sensor accelerometer/radar-solution, advanced signal processing and data fusion we can achieve a sensor system capable of classifying different movements more accurately. What is the size of the StickRadar? StickRadar is still a concept design (June 2018) but the goal is to keep the folded length below 120 cm. The overall design will be ergonomic and easy to use. We are building our FAQ database so please contribute with your question and it may turn up here with an elaborated answer.